$995 (Pro Street) is 150 HP Street Driven no abuse. Sorry I haven’t gotten back to you. I am a new father with an 8 day old son, which is amazing, so I’m pulling triple duty between home and work. I think your best option is going to be our 1776 project streetwise engine and a stock transmission. For your use, there is no need to waste money on a monster engine. 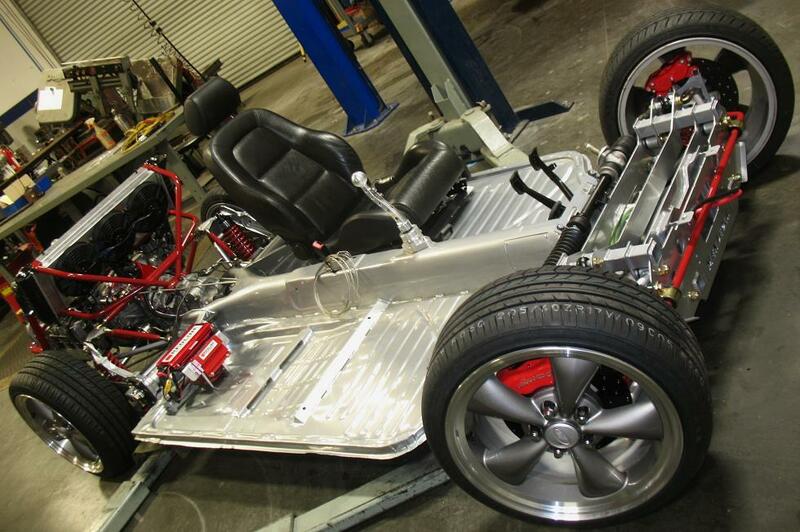 The project streetwise will give you a little more than 100hp with the dual weber 40 IDF carbs. To get yourself better low end and throttle response, I can put in a different cam and 1.25 to 1 ratio rockers. As for the trans, we can build one with the 4.12 ring and pinion. This is what I used on mine and it gives great get up and go from 0-60. Here are the links to our website on these items. First off Jim, Thank you for your interest in our products. 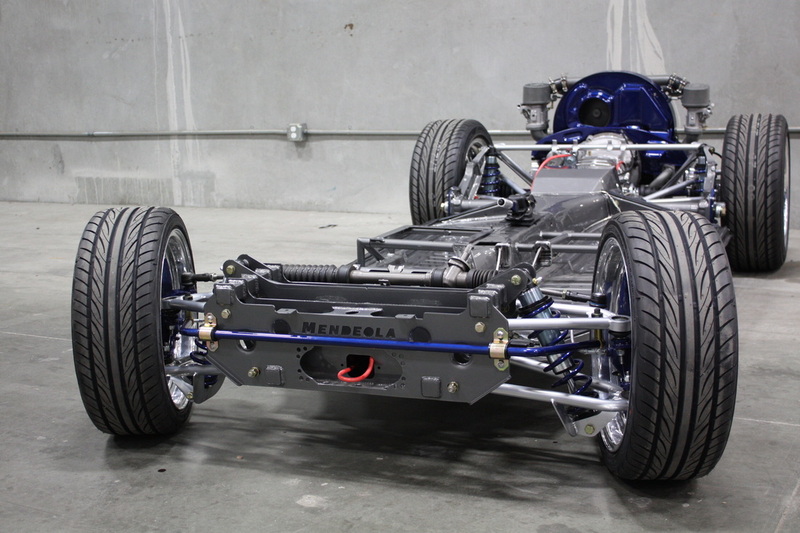 If you really want this car to handle and ride like a modern day sports car, I would say our complete Mendeola True Performance front and True Track narrowed rear kit would be the way to go. These will allow you to fit 17×7 wheels all around with 205/40/17s up front and 215/40/17s in the rear. We also offer Big brake kits for well improved stopping. We offer 11″ cross drilled and vented front and rear brake kits with 4 piston Wilwood calipers on all four corners. If you see yourself doing a lot of freeway driving or high speed driving, I would consider one of our 5 speed Porsche 915 Transaxle conversion kits. This will give you a trans that can take up to 300hp and let you run down the freeway at 80+ without running the engine above 3000 rpm. You can find most of these on our website. 2276 turbo, how much transaxle for the road? Gene Berg shifters… and other stuff. This page is an attempt to empower you to fix your own VW and do it correctly. Unfortunately, there are not many mechanics that are familiar with the VW air-cooled engines anymore, and there are some that claim to be VW experts who are really just hacks. Also, since the price of labor to have your car fixed is not affordable to many, it makes good economic sense to learn how to do the work on your Volkswagen yourself. This page is updated fairly often, and I will try to add as many articles as possible. I’ve been taking pictures of work I’ve done on my van so as soon as they get scanned, this will be like a mini-manual. I’m sure it will be nowhere near complete, but it will cover the more common and basic problems that can be easily fixed by the shadetree mechanic. The first thing you need if you want to work on your own Volkswagen is a good set of manuals. I highly recommend those listed below. “How To Keep Your Volkswagen Alive: A Manual of Step-By-Step Procedures for the Compleat Idiot” by John Muir. This book has been around since the ’60s and has been updated much since then. The edition I have now is the 25th anniversary edition. Muir’s book is excellent for the beginner but Muir is by no means the ultimate authority. You have to take a lot of what he says with a grain of salt as not all of his advice is correct. Still, it’s an excellent manual to use in conjunction with other manuals, and Muir’s writing style can make complex issues clearer. The Bentley manuals are the official factory service manuals for Volkswagen. They are put out by Robert Bentley Publishers, hence the name. They are generally very good reference manuals and I highly recommend owning one. Haynes is a British publishing company that puts out manuals on most of the air-cooled Volkswagens. Their manuals are typically readily available and are generally inexpensive. “How To Rebuild Your Volkswagen Air-Cooled Engine” by Tom Wilson. This book is a step-by-step guide to removing, tearing down, rebuilding, and then re-installing your engine. Even if you don’t plan on getting that deep into your engine, this book is filled with photos that give you a great idea of what’s really going on in there. In addition to those above, if you have a ’75 or later Beetle or Super Beetle, a ’75 or later Bus, or a ’67 and later Type 3, you should have fuel injection (assuming a US-spec model). In that case, a manual you will find very helpful is “How To Understand, Service and Modify Bosch Fuel Injection and Engine Management” by Charles O. Probst. It’s also put out by Robert Bentley Publishers, the same publisher as the official VW repair manuals. It covers all Bosch fuel injection systems, including the D-Jetronic system found on Type 3s and the L-Jetronic system found on Beetles, Super Beetles, and Buses. Finally, before you begin wrenching, see this informative tool guide. DISCLAIMER: Unfortunately, in these litigious times, some moron would probably try to sue me for something regarding the information on this page, so here’s the disclaimer. The procedures on this page are presented as guidelines ONLY. They reflect particular jobs that were done by myself or by another author and were written down from memory as a guide to others who might need to do the same procedure. I make no representations as to the accuracy of the information contained here (please remember that I am not a professional mechanic and that free advice is worth every cent). What you do to your car is what YOU do to your car. I take no responsibility for the results of YOUR actions, lack of common sense, or stupidity. The procedures below were written to help VW owners. They should always be used in conjunction with a good set of repair manuals, such as those mentioned above. Have a nice day. Replacing rear brake shoes and wheel cylinders on a Bus. Replacing the front brake pads on a Karmann Ghia. Replacing the rear brake shoes on a Vanagon. Replacing the parking brake cables on a Vanagon. Replacing the master cylinder on a Karmann Ghia. Replacing the clutch master cylinder on a Vanagon. Replacing the clutch slave cylinder in a Vanagon. 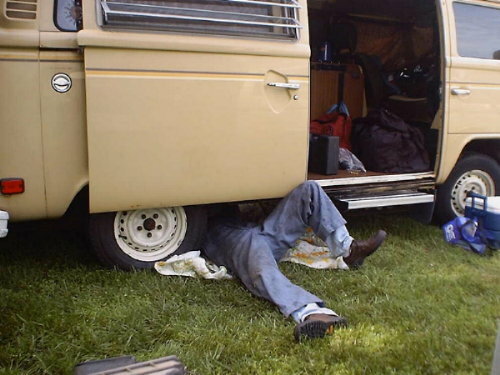 Replacing the clutch in an early Vanagon or late Bus (with Type 4 air-cooled engine). Removing and replacing the alternator on a ’72-’79 Bus. Removing and replacing the starter on an air-cooled Volkswagen. Replacing the points and condenser on an air-cooled Volkswagen engine. Replacing the spark plugs on an air-cooled Volkswagen engine. Ignition timing instructions for air-cooled Volkswagens. Carburetor removal/replacement on a 1600cc dual port Type 1 engine (Beetle, Karmann Ghia, Thing, Super Beetle). Engine and transmission removal/installation in an air-cooled, manual transmission Vanagon (1980-1983). Thermostat replacement/installation on late Buses and early Vanagons with the Type 4 air-cooled engine. Valve adjustment on a Type 1 engine. Changing the oil on an air-cooled Volkswagen engine. Replacing the pushrod tube oil seals on late Buses and early Vanagons with the Type 4 air-cooled engine. Adjusting the automatic choke on carbureted air-cooled Volkswagen engines. Adjusting the fan belt on the Type 1 engine. Replacing the heater cables on an air-cooled Vanagon. Removing/replacing the front axle beam on a late Bus. What kind of gas should you be buying? Removing/installing window glass on an air-cooled Volkswagen. How to torque the rear axle nut without a torque wrench. CV’s. Trans has a stronger 1st gear, Super Splines in the Super Diff and a C/M Pinion Retainer.